A crewmember of the Canadian Forces Station Alert in the High Arctic tests out virtual-reality gear that could help make the long trek to Mars more enjoyable for astronauts. Could virtual reality make the long trek to Mars more exciting and less stressful for astronauts? An ongoing study in the Canadian High Arctic attempts to answer that question. 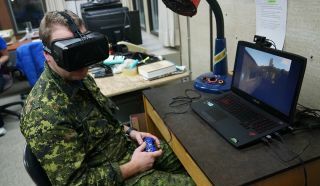 Researchers have outfitted the residents of Canadian Forces Station Alert (CFS Alert) — the most northerly permanently inhabited outpost in the world, at just 508 miles (817 kilometers) from the North Pole — with new virtual-reality gear that gives them access to beautiful scenery from New Hampshire, Australia, Ireland and an English seaside village called Wembury. Crewmembers will be isolated from their family and friends — indeed, from their entire home planet — for more than a year, during which time they will undoubtedly confront feelings of loneliness and boredom. Interpersonal conflicts could also prove challenging on a Mars mission, since the astronauts will be in close contact with each other at all times. Researchers are studying the behavioral and physiological responses of the two spaceflyers — and comparing Kelly's results to those of his identical twin brother Mark, himself a former NASA astronaut, who stayed on the ground. The three-year-long CFS Alert study, which just began its second year of field work, aims to contribute to this larger goal as well, by studying the effects of scenic beauty on folks who are isolated in an extreme environment. "At the project’s conclusion, the CFS Alert crewmembers will be asked to rate the virtual scenes for their realism and immersion, which scenes they preferred and why, and how the scenes affected their mood and stress," Dartmouth representatives wrote in the same statement. "The research is designed to enhance psychological health in space, but it is useful in other settings, such as intensive care units."